The mayor of London is to spend £6m to improve access to toilets for bus drivers working in the capital. Permanent toilets will be built along 40 routes where there is limited access to facilities. Sadiq Khan said it was "vital drivers are given the dignity of having access to a rest stop when they need it." AA president Edmund King said the investment was "welcome relief" but it "begs the question about facilities for their passengers". "Over the years many public toilets seem to have disappeared or been developed into coffee shops, wine bars, restaurants and even apartments," he said. Temporary toilets have been put in place on some routes, including arrangements for drivers to use local cafes and shops. 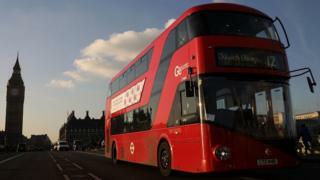 Unite official John Murphy said the announcement was "excellent news for London's bus drivers".